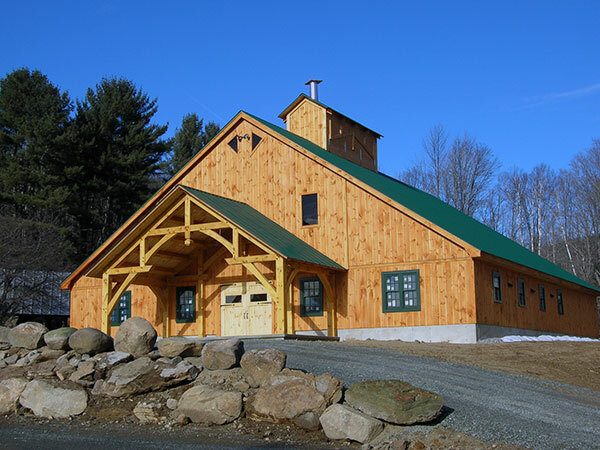 While maple sugaring is a year around business for us our production season usually begins in February and lasts until late March or early April. During this time and the preceding months things can be very hectic around the farm. First there’s the rush to finish any remaining projects and then we have to get our tubing system repairs and maintenance done before we can tap. When it looks like the weather is going to break (warm days and freezing nights) we start washing equipment and head into the sugarbush (the woods where our maple trees grow) to begin tapping the trees. 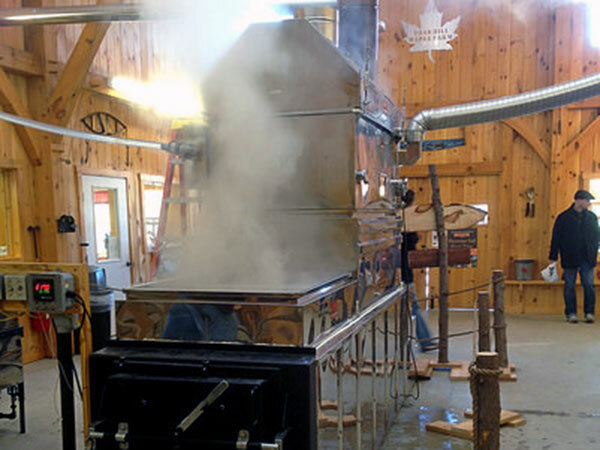 Sap is collected from the sugarbush using a system of pumps, pipe and tubing that transports the sap from all of the maple trees in our sugarbush to the large stainless-steel tanks in our surgarhouse. 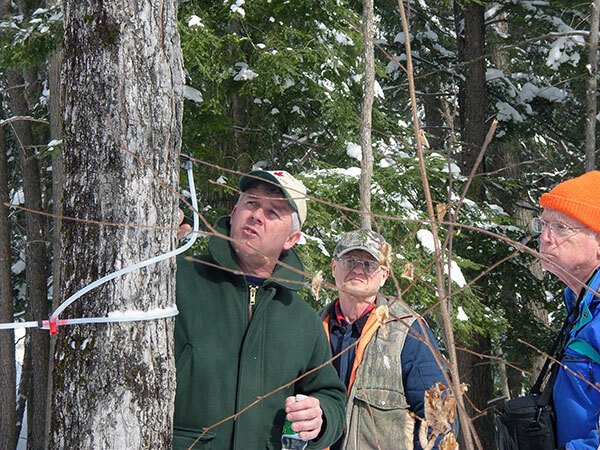 Connecting the tubing to the tree is the process of “tapping” and is done by walking to each tree, usually wearing snow shoes and walking on deep snow, drilling a hole with a cordless drill and then inserting a spout into the tap hole. We utilize a small diameter spout to minimize damage to the tree and the spout includes a check valve to prevent sap from getting drawn back into the tree, causing the tap hole to prematurely close up and reduce sap flow near the end of the season. When the tapping is done we start the vacuum system, walk our lines one more time to find and repair leaks and then cross our fingers for a good season. To help ensure maximum production we now employ a vacuum monitoring system that allows us to locate leaks and repair them as quickly as possible to keep our vacuum system operating at peak efficiency. When the weather cooperates and the sap flows, it gets pumped into the storage tanks in the sugarhouse. At this point the sap is usually around 2% sugar and looks like water. When we have collected enough sap, we begin the process by pumping it through our Reverse Osmosis machine (RO) which removes 90% of the water. The concentrate that comes out of the RO, containing all of the sugar, is then pumped into a tank that will feed the evaporator where the remaining water will be removed. At this stage in the process we need to boil away the remaining water to get the syrup to the correct density and to allow the sugars to caramelize giving the syrup its amber color and distinctive maple flavor. We do this in an evaporator that is wood fired and includes a system of stainless steel pans and an automatic draw off that lets the raw syrup out of the evaporator when it reaches the correct density. On average, it takes 40 gallons of sap to produce 1 gallon of syrup. We pride ourselves in our products and take numerous steps to ensure that they are of the highest quality. Sanitation is one of the main keys to producing quality products. To this end we regularly spend hours washing tanks and equipment so that our sap is always fresh. Finished syrup is filtered through a filter press and then stored in stainless steel drums until we open them for packaging into retail containers. All of our syrup is hot packed and we guarantee that our customers are purchasing products of the highest possible quality. Once the season is over its time to wash all of our equipment and put things away until next season. 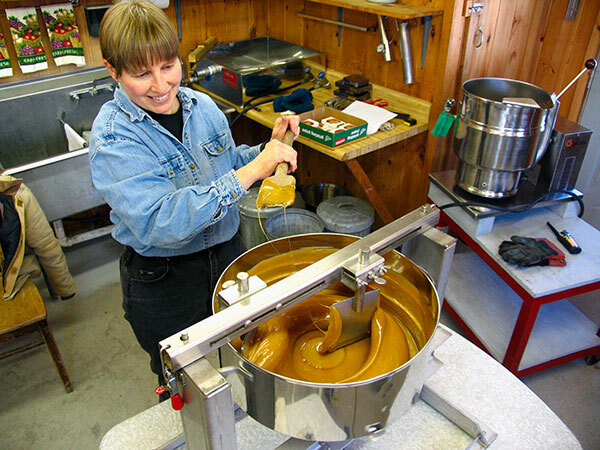 During the summer we’re busy packaging syrup, making confections, delivering to stores and working on maintenance and expansion projects. A lot of time is spent in the woods improving and expanding our sugarbush. If you would like to visit our farm to see firsthand how we do things please call first to make sure we’re not out working in the sugarbush.